I had read a review before I saw this movie, and I wrongly figured this movie would be some kind of semi-serious "alone in the woods" slasher thing - only with a brand new twist. What it really is however, is a The Truman Show  type of setup. Only this time the neighbours have been replaced with blood thirsty zombies. 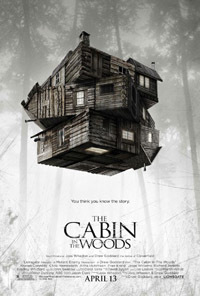 It is a bit of a horror comedy and includes all the usual stereotypes. It is rather funny at times and never boring, it was just perhaps not quite what I had expected. Most of the movie can best be described as Jason meets Evil Dead instead of the gore-fest you might have expected when zombies are involved. It seems unlikely that there will ever be a sequel after the final bloodbath which even sees Sigourney Weaver enter the movie for a few minutes.